Tagging Guide is a series of articles aimed at teams who are looking to set up or improve their tagging process in order to learn from their Intercom conversations. In Part 1, we discussed the value of Intercom conversation tagging. In this article, we will cover the practical aspects of setting up and maintaining your tagging framework. The first step in your tagging journey is to establish a tagging framework – a consistent set of tags which can summarise the contents of a customer’s conversation in a few words and can be easily understood by the members of your team. There is some debate around how specific Intercom tags should be. Intercom themselves have a flat tag hierarchy so they advocate for broad tags – what we here at Prodsight refer to as ‘categories’ – but there are a number of disadvantages to their method. Firstly, broad tags make it very difficult to search through conversations and identify only the conversations related to a specific topic. Secondly, broad tags prevent you from glancing at the tag and immediately grasping what a conversation is about, in detail. With broad tags, you get a vague sense of the conversation topic but have to re-read the entire conversation to figure out the specifics. Because Prodsight has the capability to group distinct tags into broad categories, we encourage the use of specific tags. We recommend tags that are assembled from two or three individual components, starting from an overarching category level and becoming more precise with each added component. An example of a strong tag, following this structure: "Feature Request - Photos - Filters". Now let's look at each individual component in more detail. The first component of our tag, also known as the ‘category’, refers to the most general umbrella term under which the conversation can be classified. The category component enables you to map high-level trends. The second component of your tag introduces another layer of detail about the conversation – specifying the product area (feature, product or service) mentioned in the conversation. The third component goes into further detail about the conversation’s contents – specifying the particular issue that was discussed in the conversation. 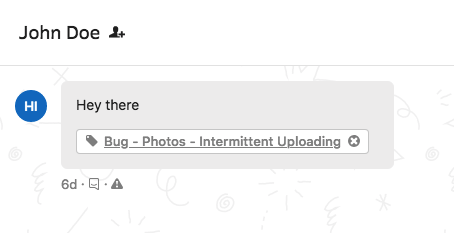 For example, if your user ran into an issue with photo uploading, you might choose to name it "Intermittent Uploading". Or if a user inquired about changing their name, you might call the issue "Name Changing". Now that you know the theory behind setting up a tagging framework, it’s time to apply it in practice. A good way to come up with your initial tag set is to have a brainstorming session with members of your support, product, marketing and sales teams. The goal is to agree on the language you are going to use for each component, as these are the basic building blocks for your tags. Generally, a good place to start is by defining the broad categories that are in line with your business processes. Then list all the product areas that concern your customers. Finally, try to recall common issues that customers enquired or complained about recently and write them down. Reading through a few Intercom conversations will help jog your memory. If you have already done some tagging prior to reading this post, you may want to consider revising your existing tags. Otherwise, skip to Step 3. You can see all of your Intercom tags by opening Intercom Settings > Company Data > People and company tags. Please note that People, Company and Conversation tags are shared. If you want to follow our tag framework when creating new tags, you want to adjust your old tags to maintain consistency. It's also a good idea to delete any duplicate or redundant tags that you may find in the process. 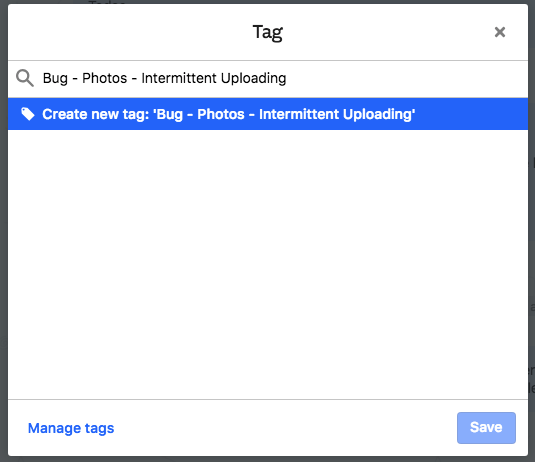 The most common way to create tags is through the Conversation view in Intercom. Go through a batch of closed customer conversations and create tags using our recommended three-part structure as you go. When in an open Intercom conversation, hover over a relevant message and click on the tag icon. Then type in the relevant tag name in the search bar and click "Create new tag". Confirm selection with "Save". Your tag will appear under the message. Repeat this process until you have covered a wide range of conversations with various tags. One thing to keep in mind when creating tags is consistency. It is essential that all tags are created by following a set process that includes a similar structure and precise terminology. Tagging consistency reduces bloat and makes understanding tags easy. You don’t want to end up in a situation where each team member creates their own version of a tag, describing common issues, and therefore produces duplicate tags. That will make it very difficult to draw any insights from your tagging effort. A powerful tool for encouraging tagging consistency is to create a shared document to record your tags, particularly the most frequently used ones. Each tag should have a brief explanation of its meaning. This shared document keeps all team members that are involved in the tagging process on the same page. It also equips you with a database of tags that makes it easy to train new staff. You can use our free template to generate and document your tags. Once you implement a tag framework, the most difficult part of self-tagging is getting into the habit of tagging every single conversation. Firstly, your support team needs to understand the value of tagging so that they are motivated to do it. You need to explain why tagging matters and the benefits of tagging and ensure your team is on board with the process. Secondly, you will want to introduce your support team to the process of tagging and your "source of truth" tag document. Take your time to walk them through the main tags and the situations in which they should be used. Finally, your team members should be confident in creating their own tags when new unique situations occur. Explain how the tags are structured so your team can create new tags without creating duplicates. In the next article as part of our Tagging Guide, we will cover some of the common issues that occur when tagging and ways to address those. Watch this space. Prodsight can help you visualise conversation topic trends whether you are tagging Intercom conversations yourself or use our Auto-tagging feature which automatically tags conversations on your behalf. If you think self-tagging is too much work, sign up for a free Prodsight trial and test-drive our Auto-tagging feature.